This chic party dress has a great flattering cut! The Morgan Cutout A-Line Dress is fully lined. It has a high neckline with a fabric cutout above the bust. The empire waist gives way to the attached A-line skirt. The back of the dress has a button closure at the neck and an exposed back zipper, completing this look. The Morgan Cutout A-Line Dress looks cute paired with strappy heels and a clutch for any semi-formal event! Details: Fully lined. Exposed back zipper. 70% cotton, 30% polyester. Lining: 100% polyester. Hand wash cold water separately. Color will bleed. No bleach. Hang to dry. Small measurements: Length from top of neckline to bottom hem: 34". Bust: 34". 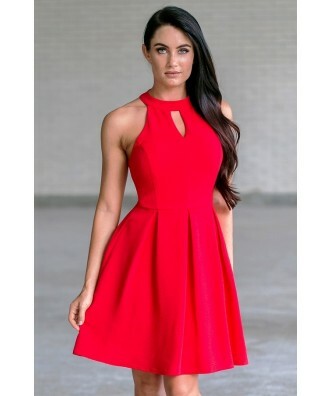 You have added Morgan Cutout A-Line Dress in Red into Wishlist. 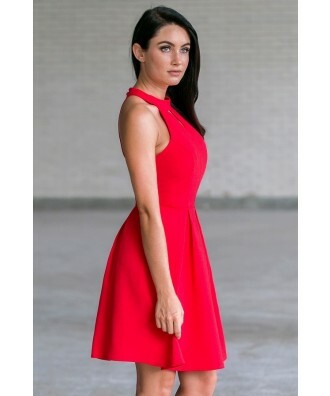 You have added Morgan Cutout A-Line Dress in Red for Stock Notification. 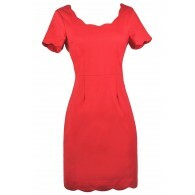 You have set Morgan Cutout A-Line Dress in Red as a loved product. You have removed Morgan Cutout A-Line Dress in Red as a loved product.